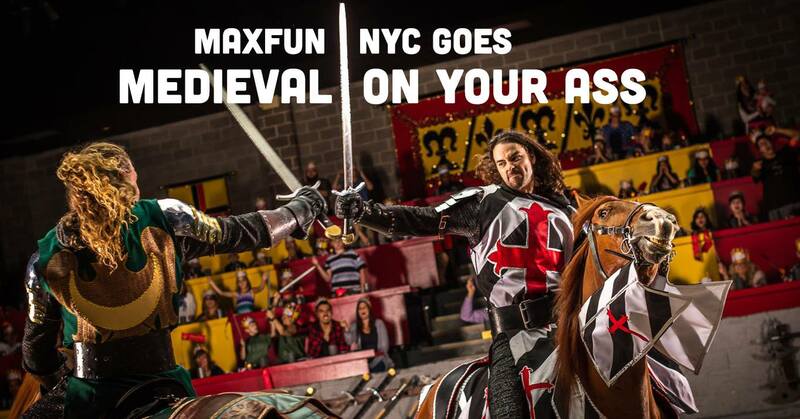 We’re going back to Medieval Times! Horses, knaves, mead and rotisserie chicken FAR better than it has any right being. Here’s the plan: we’ll meet outside Port Authority around 6:00 PM and take the bus ~20 minutes to Lyndhurst (or meet us there). We’ll attend the 7:30 PM show, using the code BF18 for $38 tickets GIFT2U18 for $30 off. From my experience, I don’t think we actually need to do a group buy in order to sit together so long as we arrive as a group (tweet to @MaxFunNYC or let us know in the Event I’m wrong on that). I’m going to get my tickets later this week. If you want to sit with the group, please RSVP in the Facebook event (preferred), tweet/DM @MaxFunNYC on Twitter, or email us to let us know you’ll be joining us!